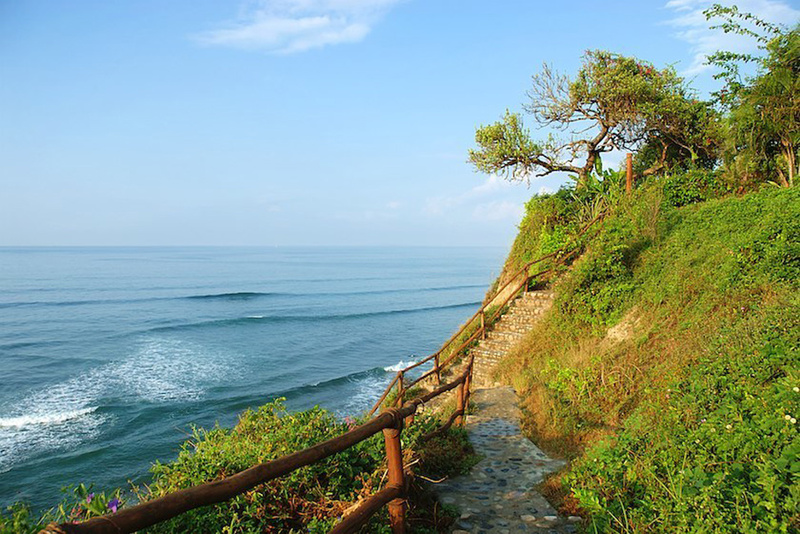 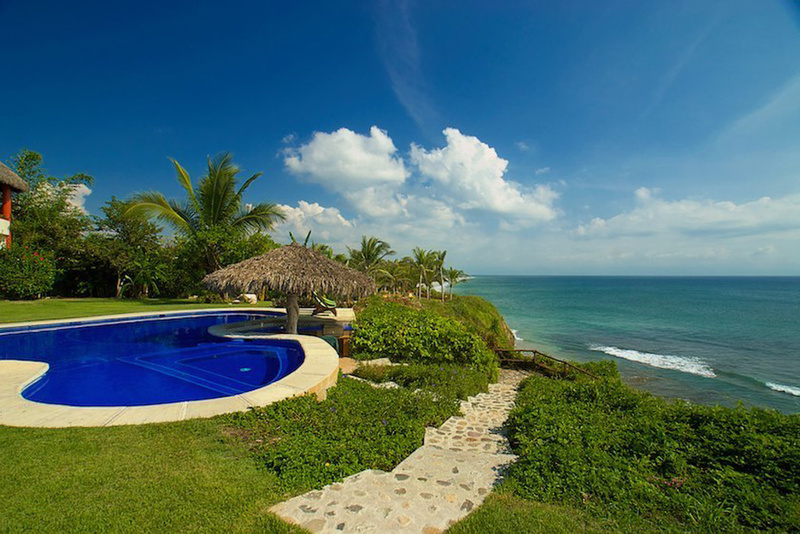 The Surfer’s Choice, Casa Aguas Vivas is built on the cliff over looking one of the best, if not the best surf breaks in Bahia de Banderas. 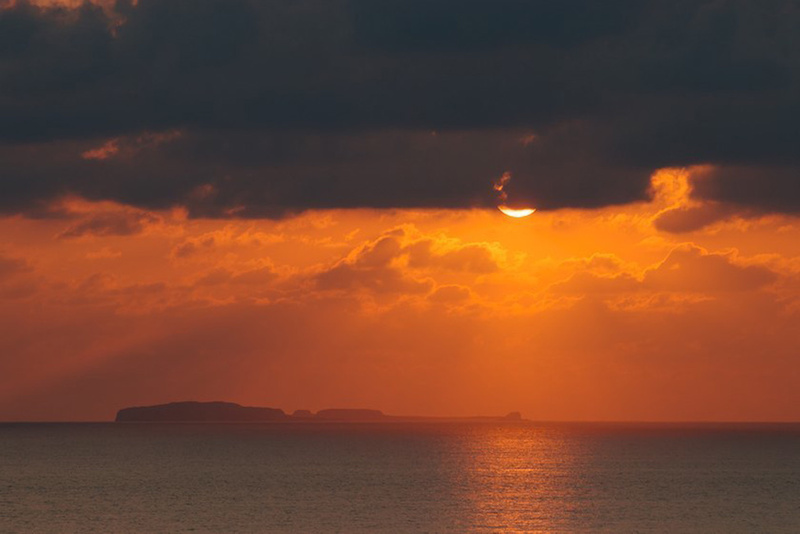 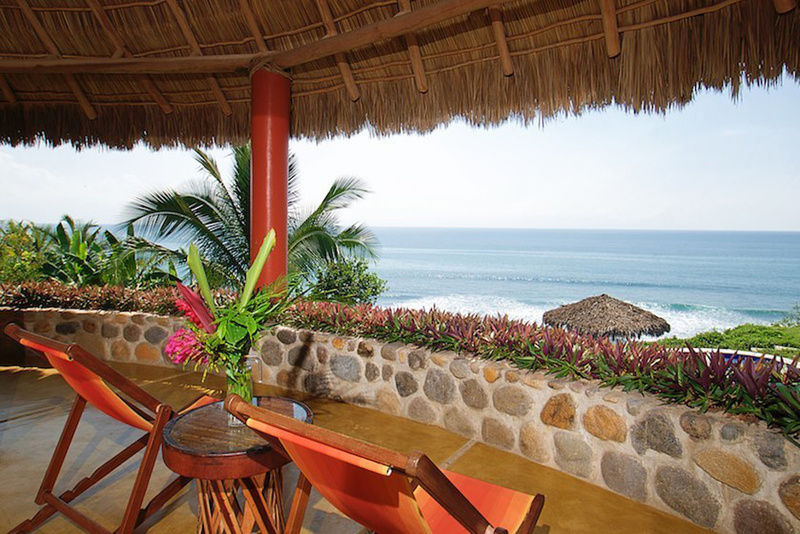 No dawn patrol here, just go out back and or look out the window at the waves and if it ain’t breakin go back to bed. 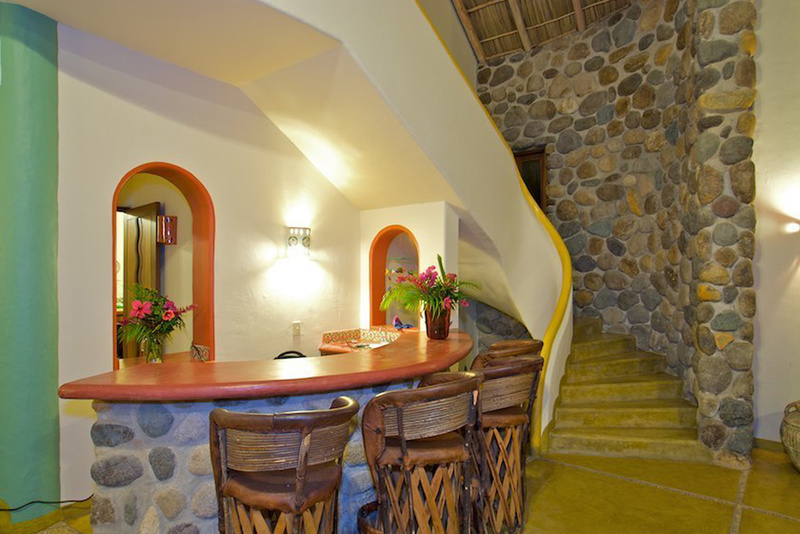 When it is breaking, Dinosaurs is right down the stairwell. 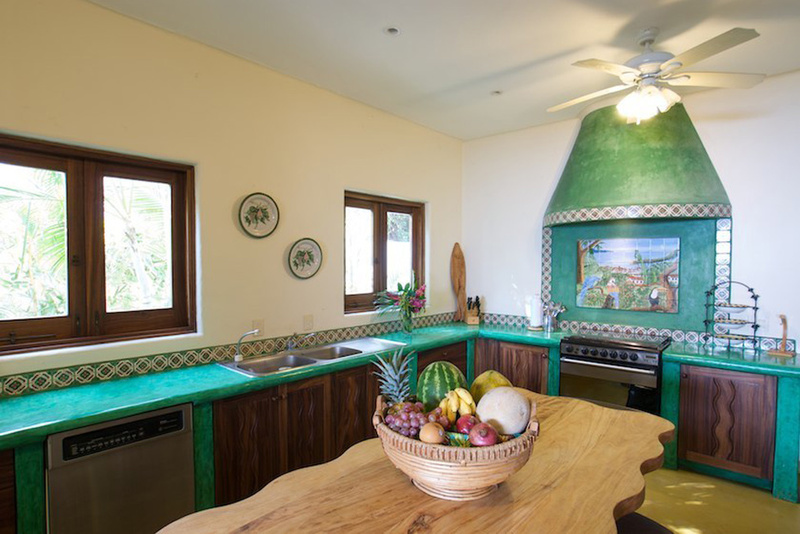 The specific reason the owners bought and built Casa Aguas Vivas at this location is, Dinosaurs, the surf break. 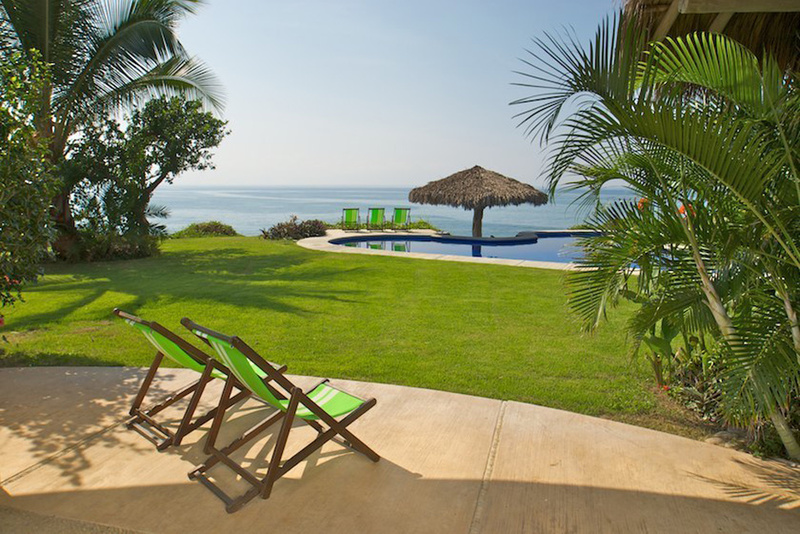 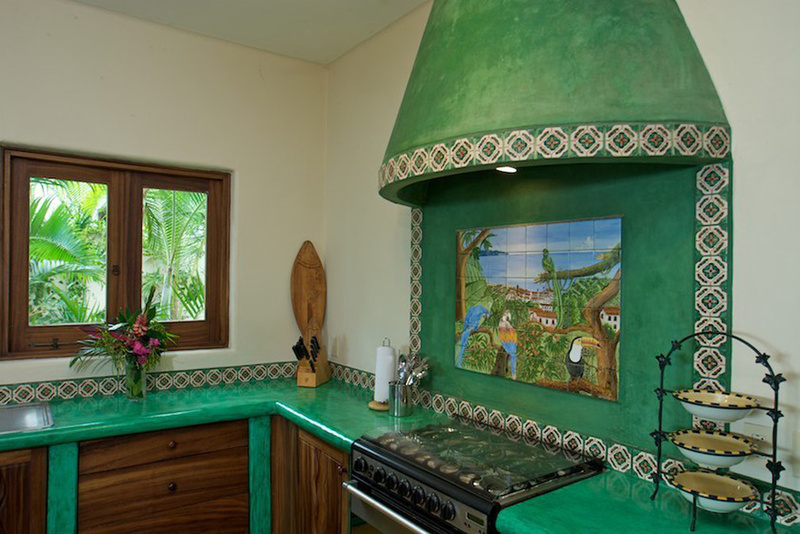 Private and secluded in the residential neighborhood of El Farallon this upmarket property is only 25km north of the international airport in Puerto Vallarta. 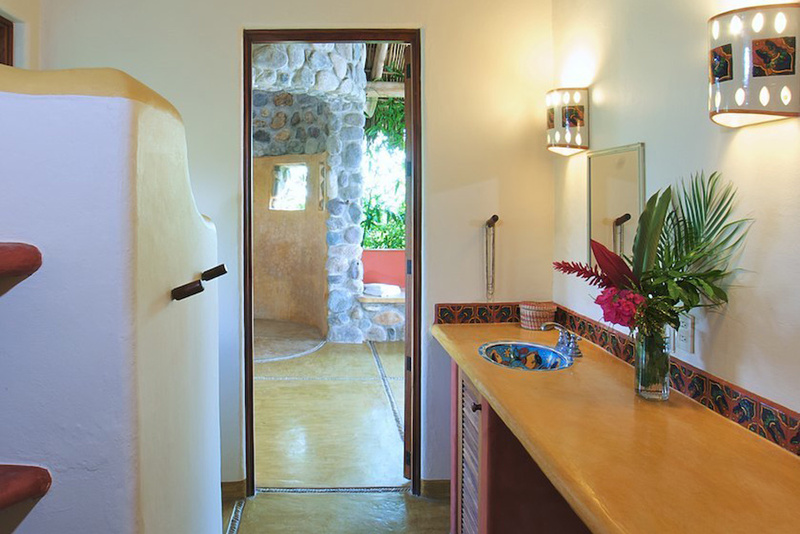 There are 3 ensuite bedrooms and a bunch of bathrooms. 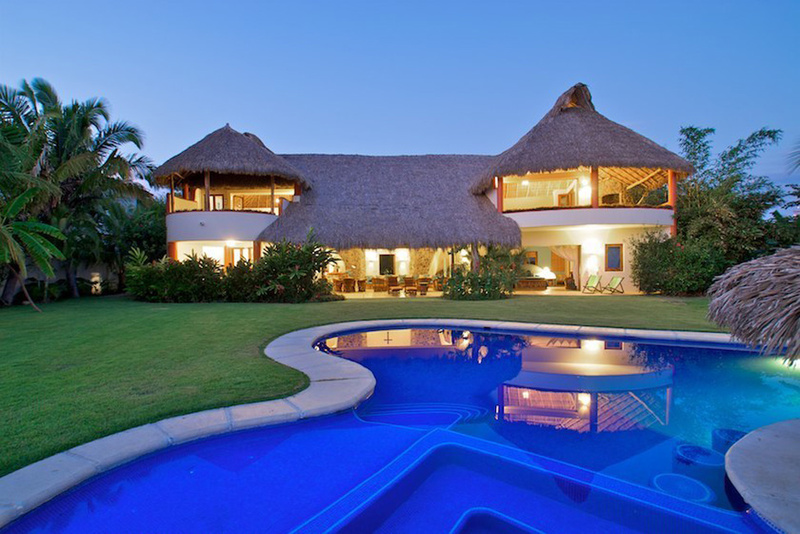 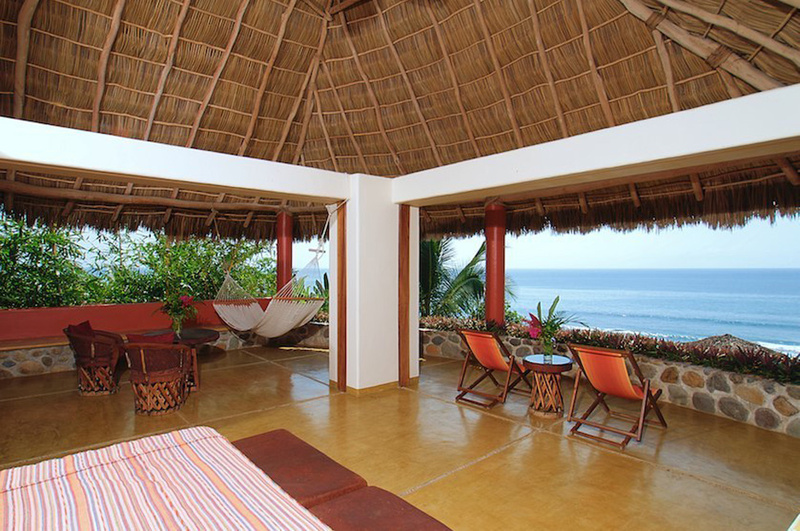 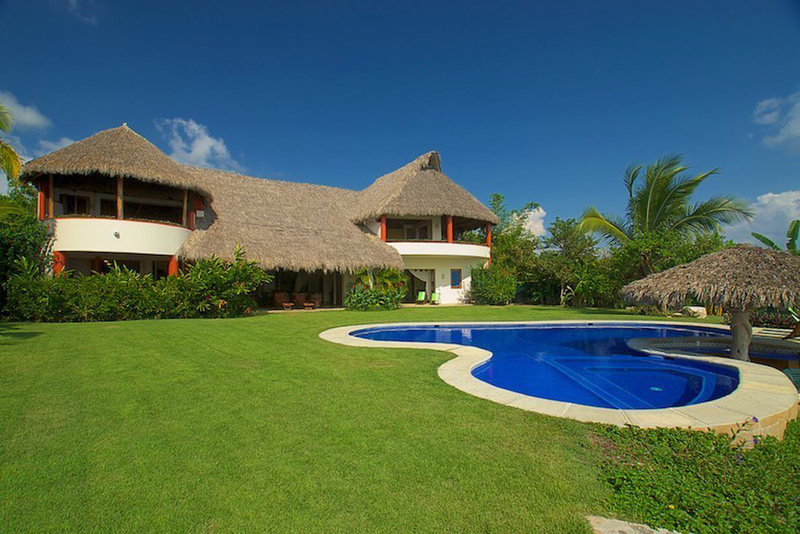 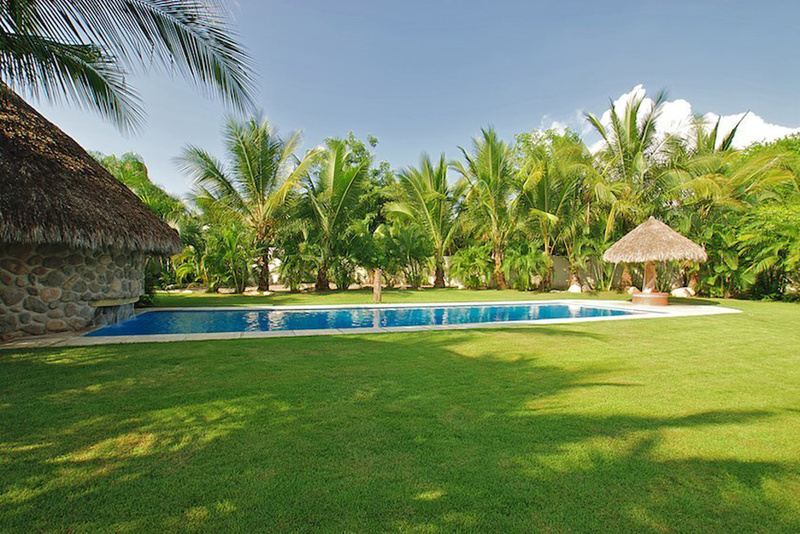 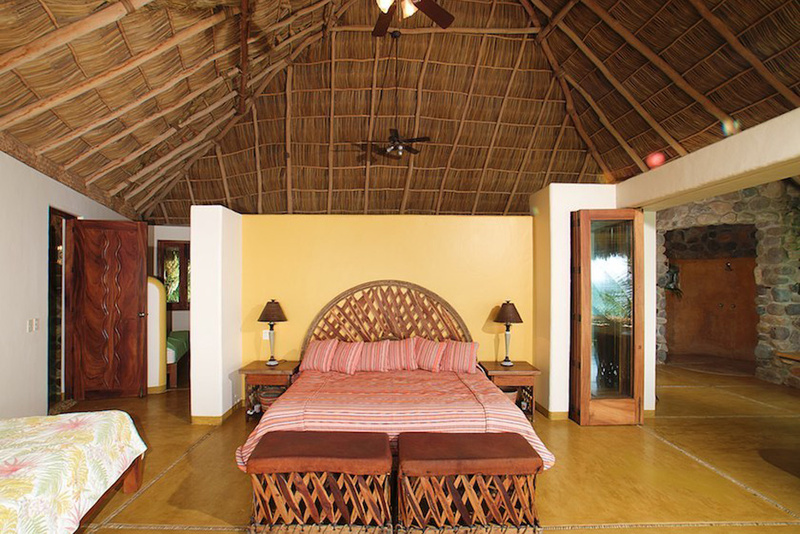 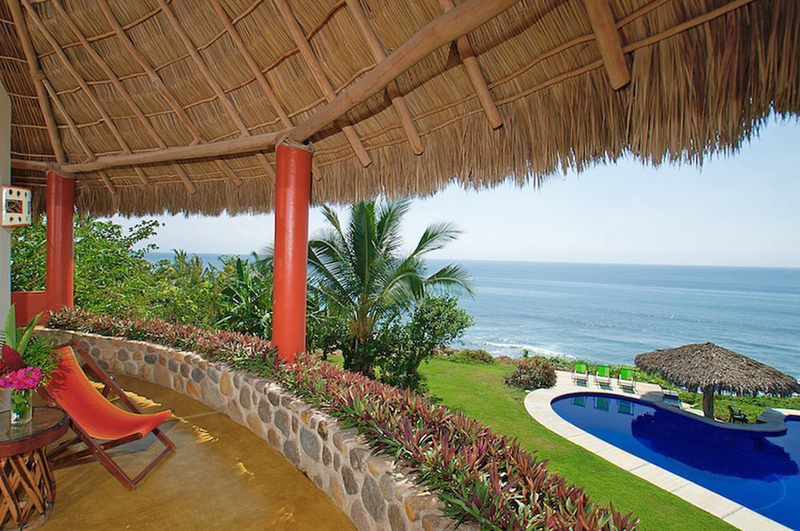 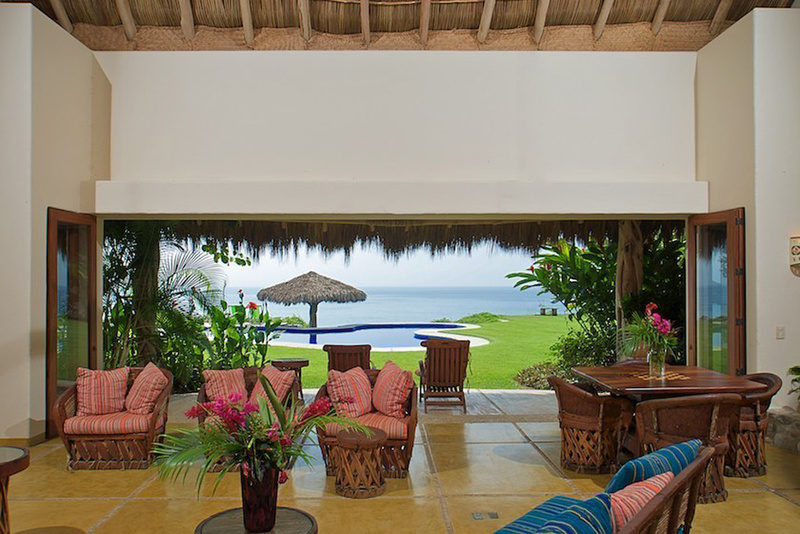 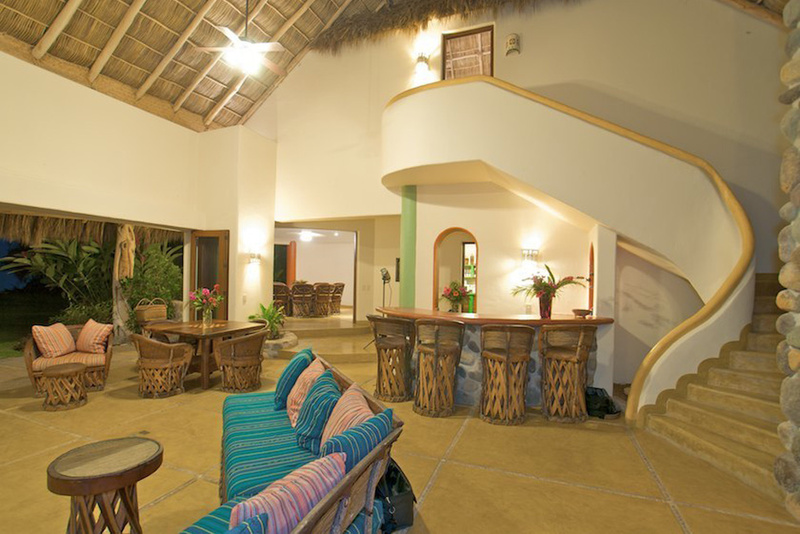 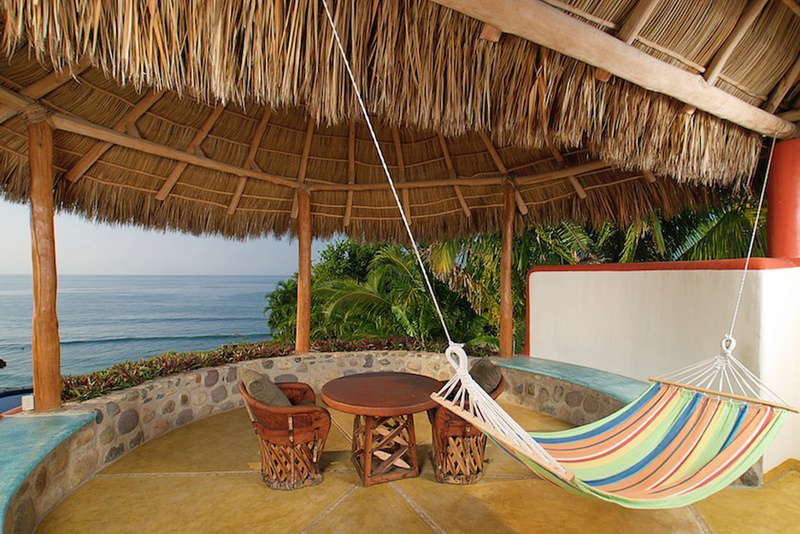 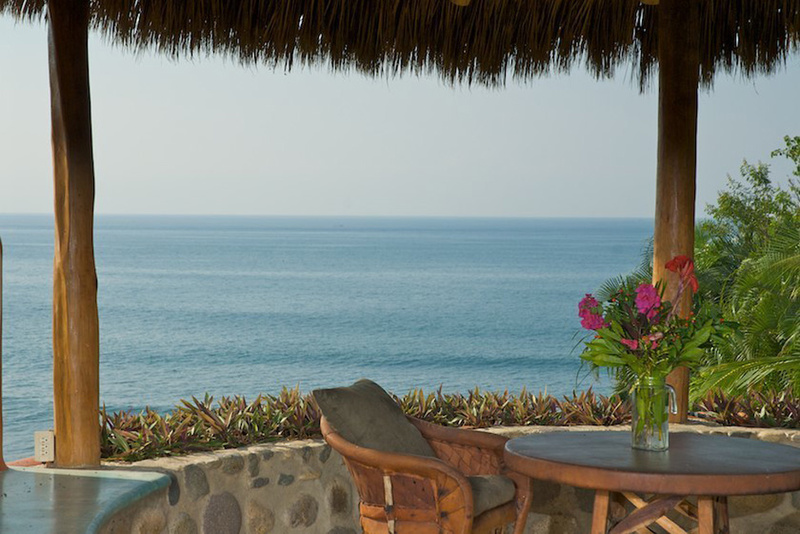 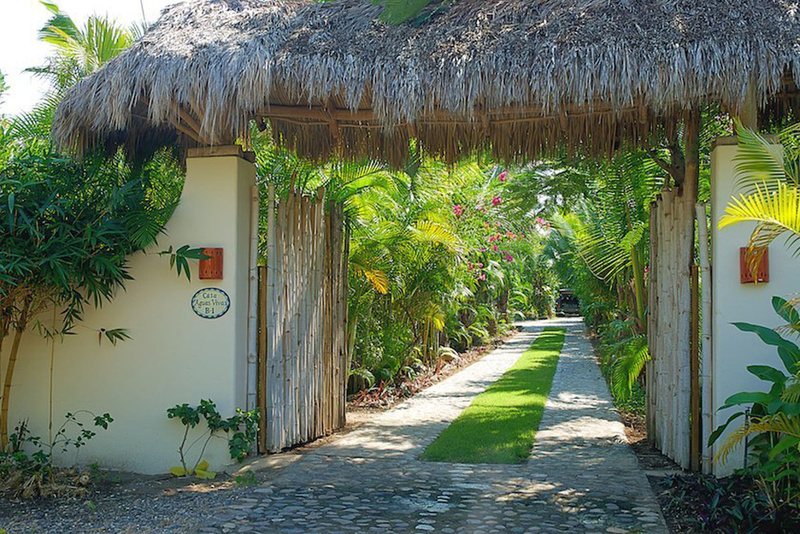 A palapa roof covers 7000+ square feet of living area and is more than 45 feet high. 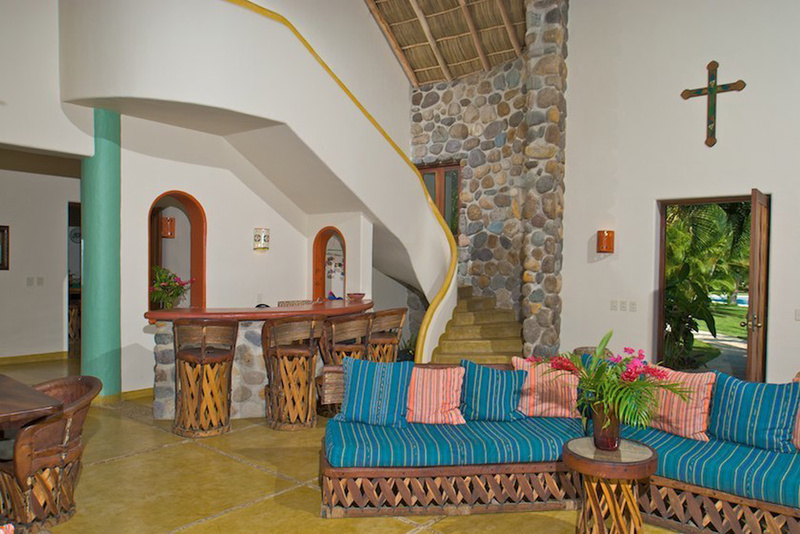 Accessed by its own private stairway the second floor master bedroom luxury is over 1500 square feet. 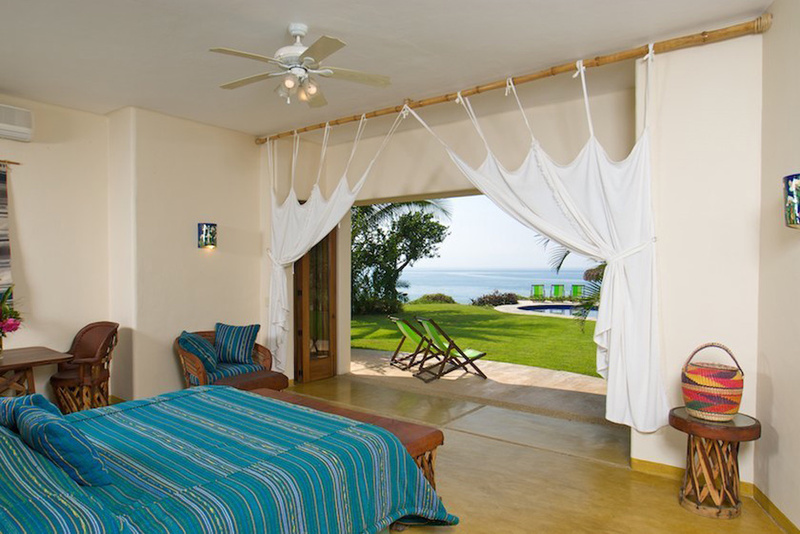 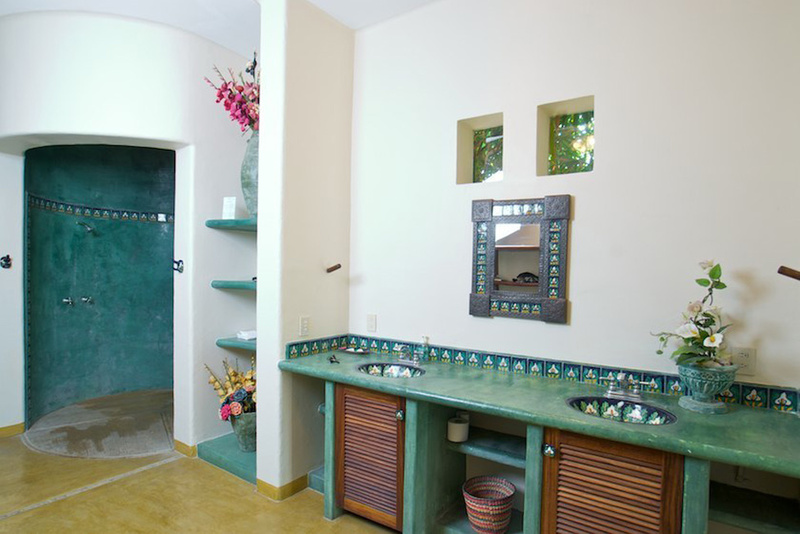 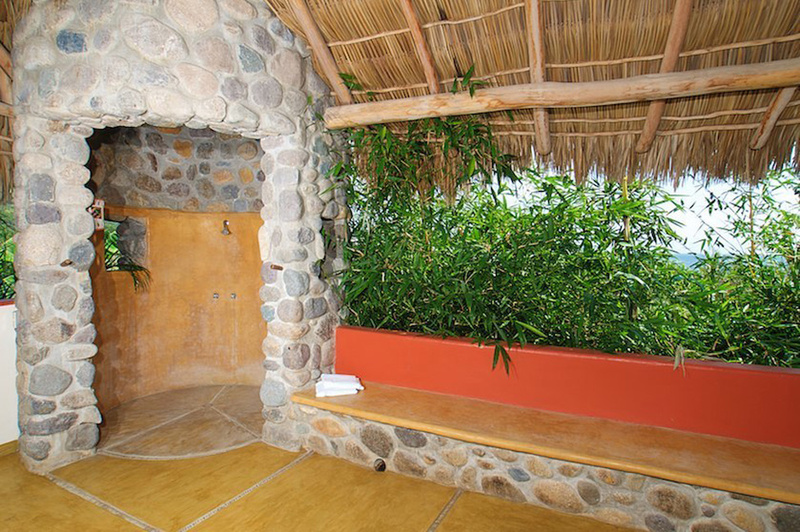 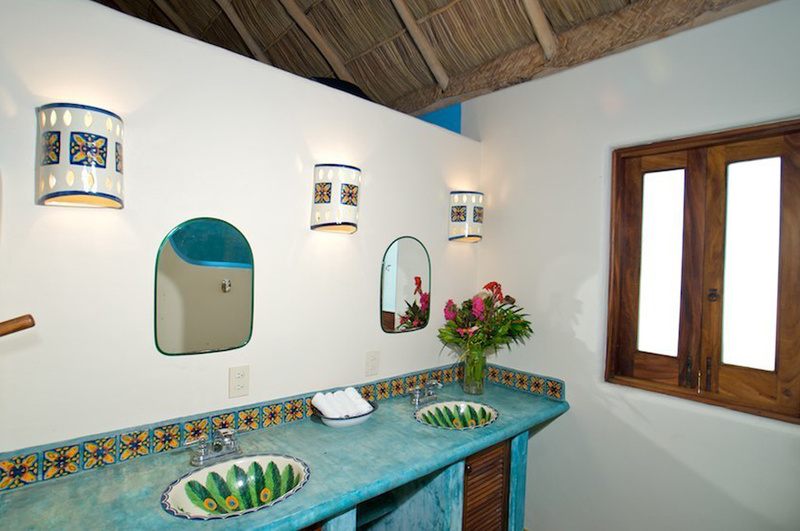 Indoor and outdoor showers and bathtubs and 270 degree views wrap around the house and you, Aguavivas has it all. 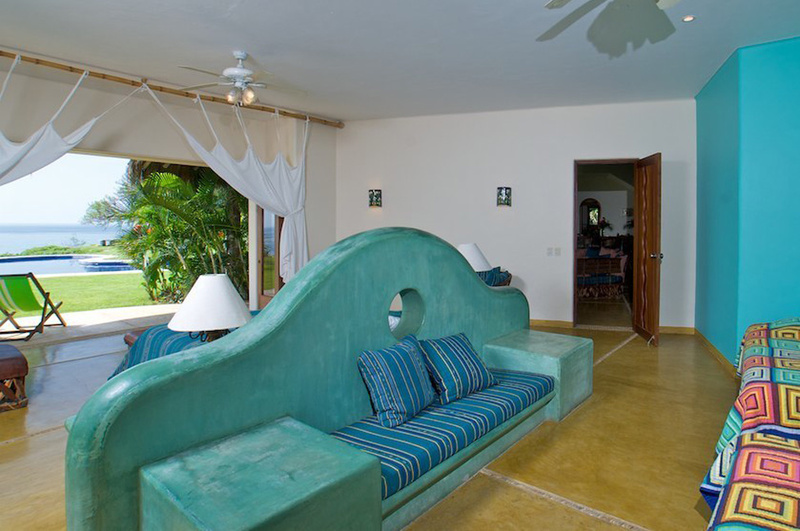 The second bedroom suite is on the opposite end of the residence and on the second floor as well. 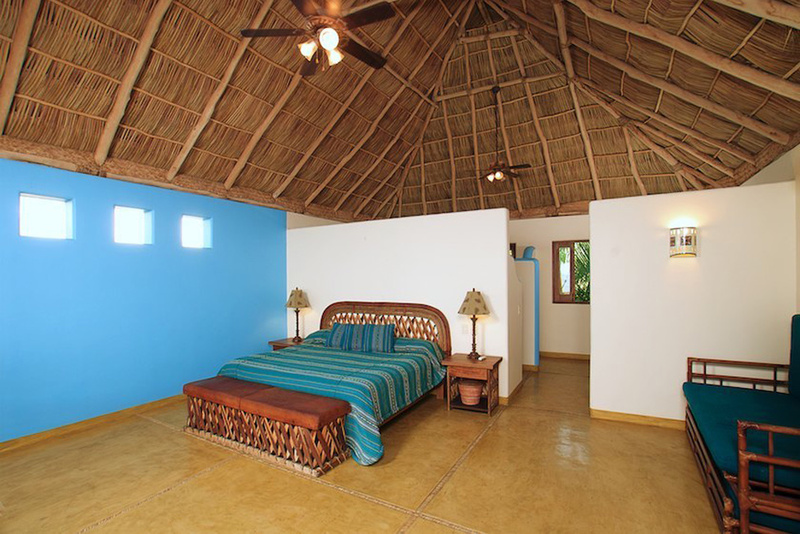 A little smaller at around 1100 square feet bedroom chamber 2 is accessed by a private stairway. 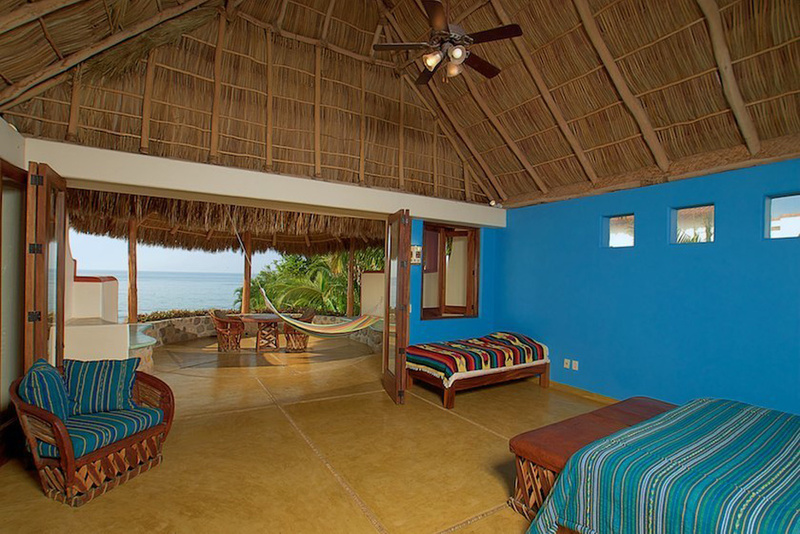 The third bedroom is on the bottom floor and just as nice as the upper bedrooms but much closer to the 2 swimming pools and the beach and kitchen. 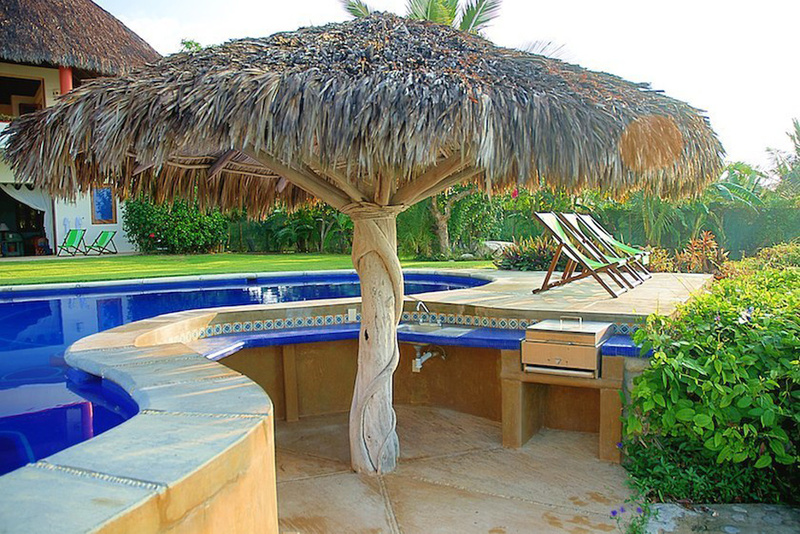 Yes, on each side of the house is a pool. 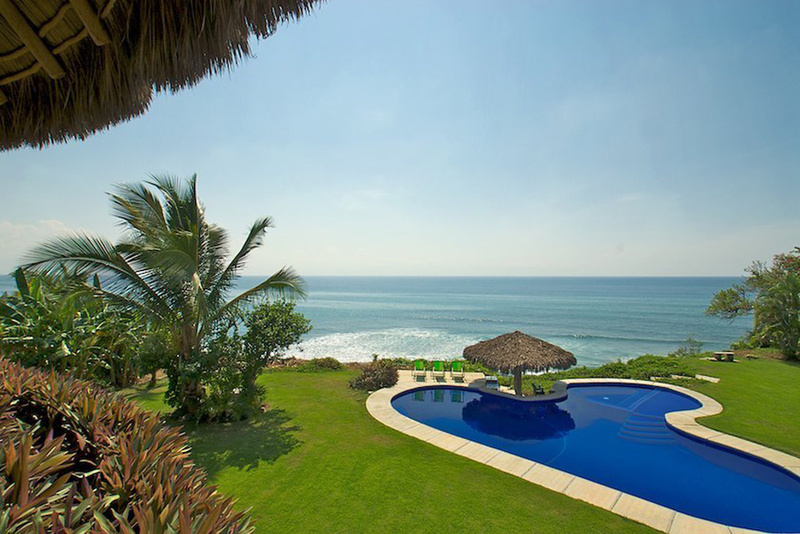 One pool is fitted with a net for volleyball and the ocean pool has a bar. 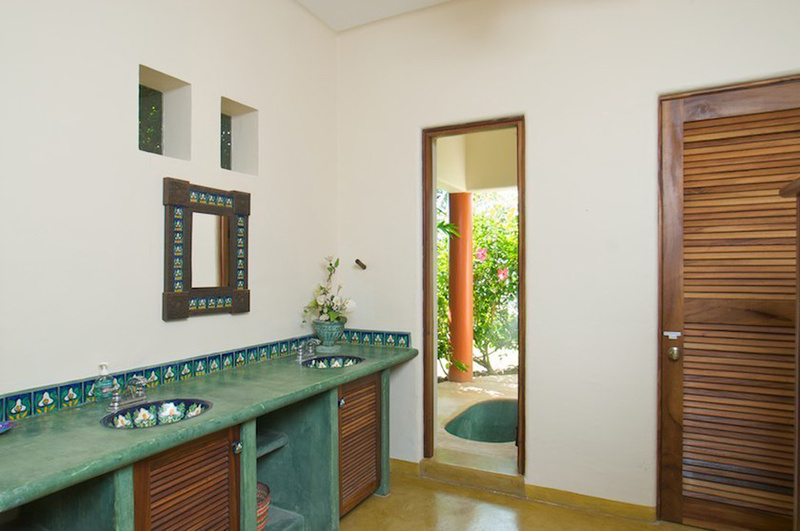 Both pools have bathrooms. 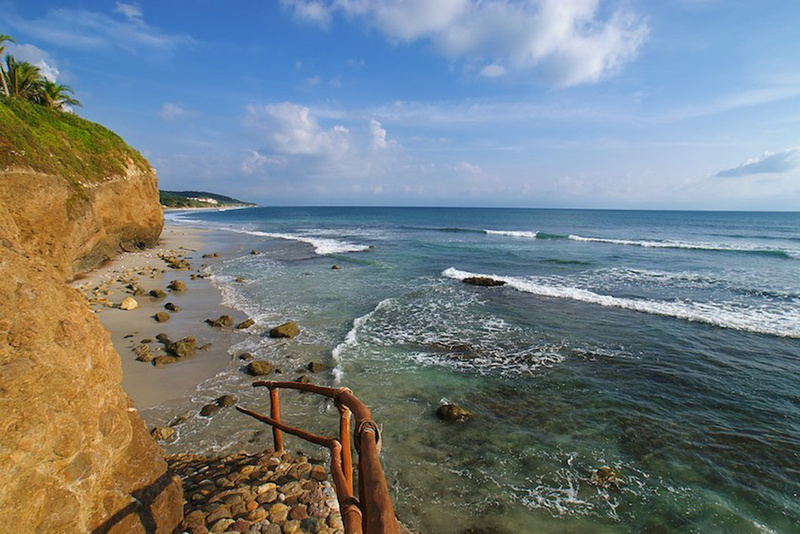 Surfing, boogie boarding, paddle boarding (SUP), swimming, snorkeling, scuba diving, sailing, wind surfing, kite surfing, kayaking, jet skis, whale watching, bird watching, ziplines.